I used to be so scared to invite people into my home. Hospitality felt like something I just wasn’t good at. In fact, I told myself for a long time that I’m an introverted person who is a homebody and who doesn’t host things or initiate. And by telling myself this, I had convinced myself that hosting and initiating weren’t my gifts or my personality. It was safer to wait to let other people do the inviting. It was safer to convince myself I wasn’t the type to step out, step up, initiate, or lead. But all that changed when I read Just Open the Door by Jen Schmidt. It’s a book written specifically for people like me who feel so awkward about the whole hospitality thing. If you feel like you aren’t a good cook or you think your house isn’t nice enough or you don’t feel like you’re organized enough or you think you don’t have room to host people or a dozen other excuses… and yet you are also craving deep community and authentic relationships, this book is for you. Just Open the Door will show you that no matter the size of your home or your budget and no matter your current season of life, there is a way to show hospitality. 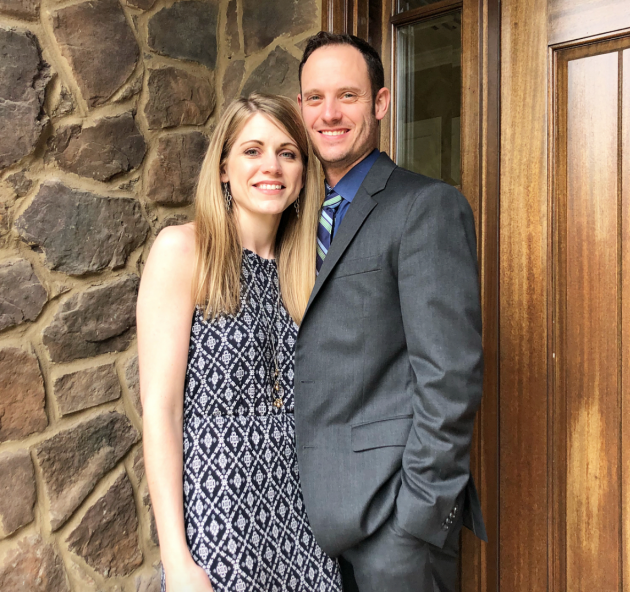 And, you’ll learn just how big of an impact opening your home and door and life can have — not just in other’s lives, not just in your kids’ lives, but in your own heart and life. 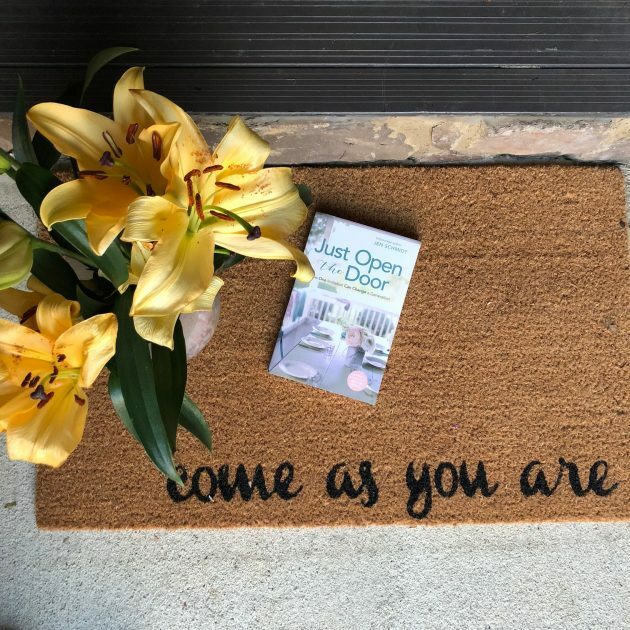 After reading a pre-release copy of Just Open the Door in December of 2017, I felt stirred to step way outside my comfort zone and commit to opening up our home every single week in 2018. I had no idea how that was going to transform my life! 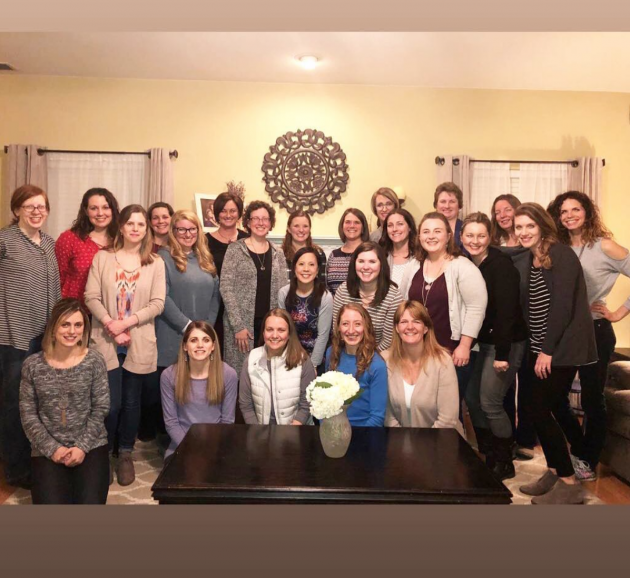 Just for fun, I counted up and, since January 1, we have hosted at least 135 people in our home and have opened up our home at least 22 different times! All of that in three months — and we moved during that time period, too! I’ve fostered many new and beautiful relationships. I’ve deepened old relationships. I’ve learned a lot of new hospitality tips and tricks… and had some funny and memorable fails. I’m learning that when I start looking for opportunities to exercise hospitality, I begin to see them all around me. For you, it might look completely different. But no matter your stage or circumstance or season of life, there is a way that you can reach out and open your door — even if it’s just opening up the door of your heart by inviting friends to have a picnic at the park or inviting a friend to join you for a walk (see more of my ideas for Hospitality on a Budget here). You Don’t Have to Be a Great Cook to Be Hospitable! 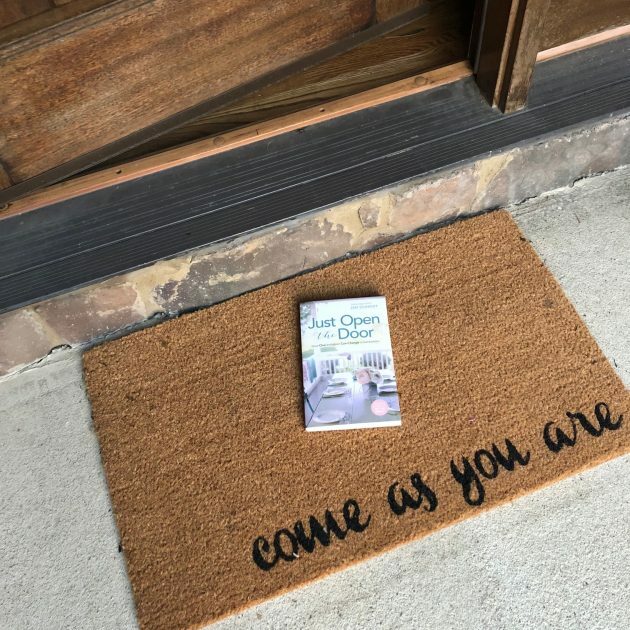 I’ve discovered that I don’t have to be a great cook or decorator or party planner to be great at welcoming people into our home. Some nights, I didn’t have time to offer much more than takeout pizza or a simple crockpot meal. But we still had a great evening! 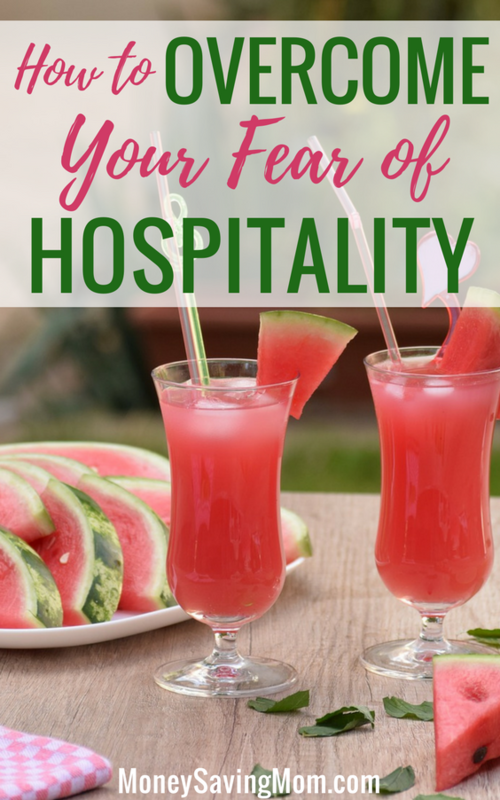 As I’m learning, hospitality isn’t about the food you serve or the home you have or the table decor or the seating arrangement, it’s about opening the door and welcoming people into your real, imperfect life. It’s about letting people know that they are seen, heard, cared for, and loved. It’s about just opening your door! The more that I open up my door, the more that I want to open it up. And the more I’m realizing how much THIS is where real relationships and community develops. You have to experience the awkward in friendship in order to experience the awesome in friendship. You have to be willing to take risks. To not wait for an invite, but to be the initiator. To be okay if someone says no or a relationship doesn’t turn out like you hoped. Those seeds of friendship, when watered and nurtured and fostered and tended to, will grow into a least some strong relationships and friendships. It’s so worth the effort! Because of how much Just Open The Door has changed my life and changed me as a person, so many of you have asked me how you can get your hands on this book. I am thrilled to let you know that it is finally available to order! This book is SO encouraging for those fearful of hospitality and hosting. It shows you how hospitality is so much more than a physical space and starts with simply opening up your heart to let people in. It gives you practical ways to open up your door and show hospitality — even when you feel like your home is too small or you can’t afford to prepare a fancy four-course meal. So if you’ve been wanting to open your home (and heart) to others more, but you’ve held back out of fear, I can’t recommend this book enough! 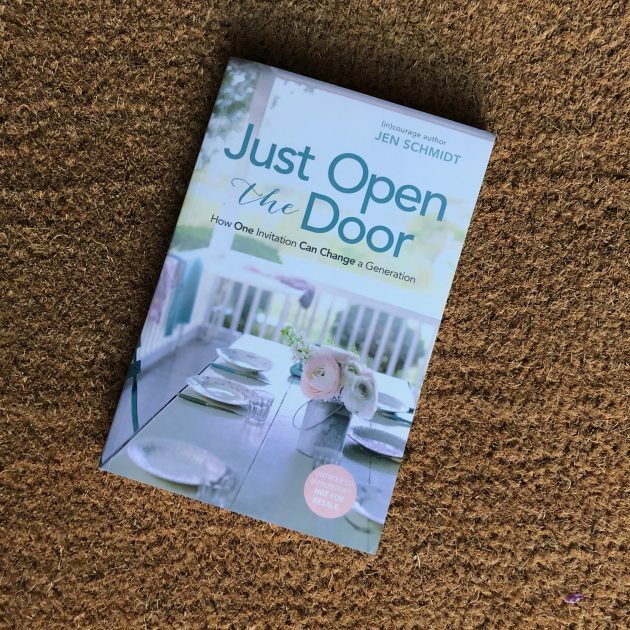 Go here to get your copy of Just Open The Door! I love what you’ve been sharing your journey to share your home and life with others. It’s been interesting because I’ve been on a similar journey though I’ve always had people over, but I’ve been learning to open my heart to more people and be the initiator more than ever before in the last year or so. There was, in fact, a time in March where I literally had people over 4 out of 6 days and I cooked for all them. After I had finished with that run, I was amazed that I had actually been able to pull that off! On the other hand, I have learned to know my limits and this week I’ve been feeling tired and a little under the weather. For that reason, I’ve committed to not having anyone over and just resting as much as I can. (That’s a bit tough because starting Thursday I’m really busy again) But giving myself grace is so important, too. I’d love to hear good ideas/resources for hospitality when it seems like everyone is on a different (and usually very restrictive) diet these days. It would be so much fun to invite people over for last minute take-out pizza, for example, but this person can’t have dairy, that family is gluten-free, etc. (I seriously can only think of one or two families we know who could actually come over for take-out pizza. 🙂 How do you entertain when figuring out any kind of meal, snack or dessert seems daunting, especially for those of us who aren’t used to cooking for restrictive diets? 😛 Does anyone else run into this problem? As someone who had a daughter with Celiac Disease long before anyone heard of “gluten”, I can share that it is easier than you think, especially nowadays where you can buy things off the shelf! If it is someone close to you, talk to them and get ideas. It’s nice to have a “safe” place to go. We had friends that would make a specific meal when we went over, that we had worked out ahead of time. Usually hamburgs and sides. Other times I would bring the main dish, so that’s a possibility, as well, making it a potluck. If it’s a new group of people, offer something simple like fruit and vegetable trays. it doesn’t have to be complicated. Pinterest has ruined entertaining in some aspects, because there is pressure to have a certain flair. Personally, I stay away from Pinterest (which wasn’t around when I was raising my family) and go with tried and true recipes. Great tips, Sandy! Thank you! Another thing I often do is ask if they’d like to bring something — especially if there are allergies. A simple meal like rotisserie chicken or chicken baked in the crockpot with roasted broccoli, fruit salad, and rice is one option that usually can be eaten by almost everyone. Yes, I have run into this problem of special diets within my own extended family. It makes things a bit stressful when celebrating birthdays and holidays. Special diets for health reasons is one thing, but when we get into preferences on top of that, I start to lose it! And then there are friends of my kids who have decided they are vegan or vegetarian. It makes it tough to cater to all these different people! YES! I’m all about those types of meals! I try to always ask about allergies and then plan accordingly. I also love more build your own type meals so that people can pick and choose what works for them. Soup is a great option much of the time because it’s usually gluten-free and then you can just have veggies, cut up fruit, cheese, crackers, etc. on the side. Thank you all for the great suggestions!! I also want to do a BYOL event- Bring your Own Lunch. I work for a few hours in the morning and my baby needs a nap when he comes home. I’d like to invite one or two ladies over to my house to eat (bring your own lunch!) and chat while baby is napping, and before preschool pickup (having preschool pickup makes it so there would be a finite end). There’s a friend who moved one neighborhood over. I might see if I can invite her over for tea one evening. I love the Bring Your Own Lunch idea! Thanks for sharing! I preordered the book and am patiently waiting to receive it next week. After I read it, perhaps I’ll end up choosing the DVD study by Jen Schmidt that goes along with it for my women’s group at church. This seems like it would be an excellent fit. Something else to consider: are all the people around us just like us? Or have we reached out to people who are not our age range, gender, race, economic group? There are quality friendships waiting to be nurtured in diverse relationships. YES! I so agree — and this is something we’re working on teaching our kids in their friend groups, too! Most of my friends are SO different than me in many respects and yet there’s much, much that I can learn from them because of that! One of my favorite books that influenced me in the areas of homemaking and hospitality was “The Hidden Art of Homemaking” by Edith Schaeffer. It reads like she speaks so it had a feel of mentoring. (If you haven’t heard her speak, it may seem boring, but I didn’t find it so.) She had a gracious spirit and wonderful insight. I highly recommend adding it to one of your reading lists, it will be an encouragement. I love that book! I’ve read it more than once! But I think her love of beauty and making everything so beautiful and special sort of scared me off when it came to hospitality. So I’ve had to give myself grace to realize that hospitality can look like many different things! I did not see this addressed in your post: My problem is I’m a clean freak and CANNOT stand seeing my home dirty. I also do not enjoy the prepping or the cleaning up and I find myself feeling annoyed and resentful because of all the extra work. Does the book address this? I do not want to feel this way. Yes, the book definitely addresses this. I’d encourage you to ask yourself where this is coming from… is it something from your past? Are you worried what people will think? Are you just a person who is really sensitive to clutter? Etc. And another thing to consider: What about starting out with just inviting someone out to coffee? And then, once you feel comfortable with that, moving up to a picnic at the park or an outdoor cookout? Thanks Crystal. I am hypersensitive to clutter and I tend to overdue entertaining (in my mind) to please everyone’s tastes that I end up not wanting to entertain at all. I appreciate the babysteps approach. I’ll think about that too. Can’t wait for nice weather so I can invite some families over. I find it’s so much easier to entertain when the kids can play outside and we can throw something simple on the grill. Are the bonus offers for the paper book only or also the ebook? What I struggle with is that we invite people over frequently, but with the exception of one family, NOBODY EVER reciprocates. And, I really do mean nobody! I know I shouldn’t be “keeping score” when it comes to opening up my home and my life – but after years of this I’m getting weary. It would be nice for someone else to invite our family over, or if they’re not up to entertaining in their home, even just initiating a dinner out together or some other get-together. I’d love suggestions for dealing with this? I’d really look for people who you can build relationships with who will pour back into you. That’s what I started praying for last year and then I started being really intentional in which relationships I invested a lot of time into — because I have plenty of opportunities to pour and give, but I knew I really needed two-way relationships where there is give and take. So I started praying for it and then I started actively paying attention to who was investing back into me and I began putting more time and effort into those life-giving relationships. I hope you’re able to find those same kinds of people! Thanks for sharing. I like the ideas. I believe if people just step out to invite people over and get to know people our communities would be better. 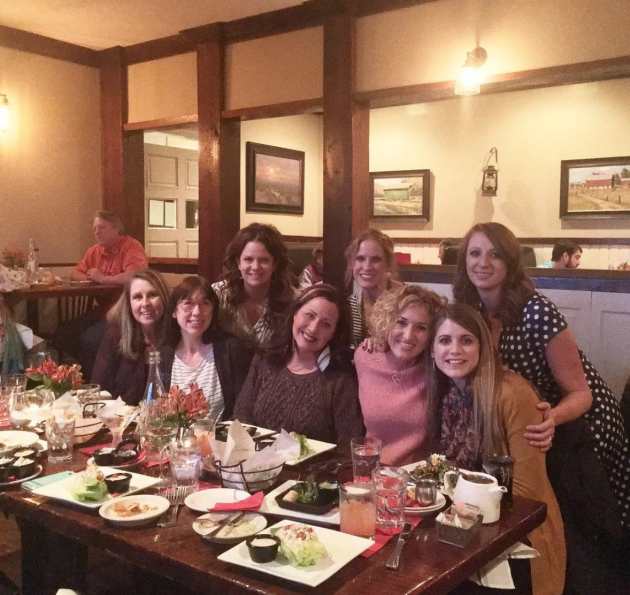 One thing I do is invite those who impacted my life to have lunch with me. Fellowship is important to me. It takes time build new friendships. This is so encouraging. Thanks you for sharing such a thoughtful and honest post.